The Tata Nano is famous for being the cheapest new car that you can buy, but there is a one-off version that is now the most expensive new car as well. However, this version has not got anything new in the way of power, performance or anything else you would expect of a car with a seven-figure pricetag, and it is not one you will be able to buy either. The one-off Nano looks like it has coated itself in Pritt Stick and gone joyriding through its nearest branch of H Samuel. 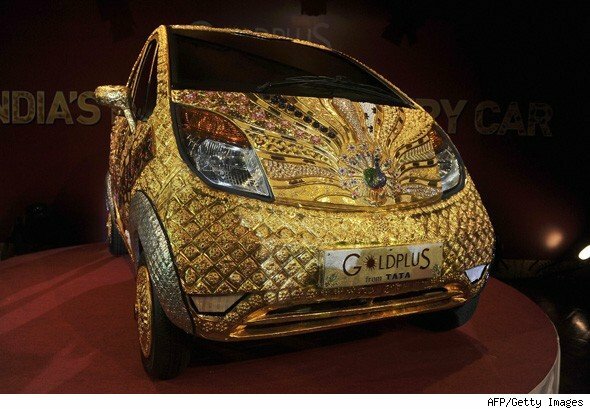 The result is a car festooned with gold, silver and gemstone trimmings, adding a hefty chunk to the pricetag. The adornments add at least 95kg to the weight, ruling out any hope that the already rather slow Nano (the two-cylinder engine manages a top speed of 65mph) will offer any more performance for your massive outlay. That is 80kg of 22 karat gold, and 15kg of silver, and there are a fair few gemstones to take into account as well. 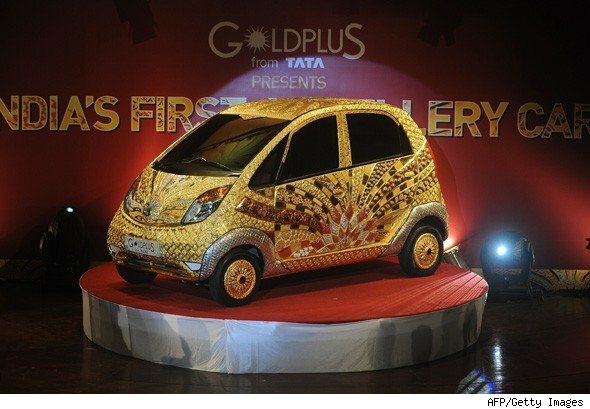 The car is claimed to be the "world's first gold jewellery car", but it goes to show that no matter what bling you throw at the Nano, it still looks cheap.